Christmas is a time to celebrate traditions, both old and new. Across the world, families will gather to put up trees, decorate their homes with lights and sing joyous songs about the Christmas season. Linvilla Orchards continues the ancient Wassailing tradition with Caroling Hayrides running today and on December 8th, 15th, and 22nd at 5 and 6:30pm. So join in on the tradition and bring your family as you snuggle together and take a ride through the orchards. The wagon stops among the apple trees where you’ll disembark and sing carols while warming up around a crackling campfire. Partake in the magic of the season with this hayride for only $5 per person! 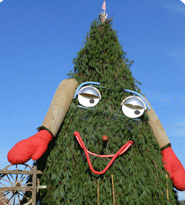 Enjoy the entire experience of Christmas Around the Farm at Linvilla Orchards! Purchase your wreaths and other holiday decorations while the kids visit Santa Clause to share with him their Christmas wish lists. Make memories this Christmas season that will last forever at Linvilla Orchards. Linvilla Orchards, located at 137 West Knowlton Road, Media, PA, is a 300-acre family farm dedicated to agriculture, education and entertainment. To learn more visit www.linvilla.com.